Nanogels are nanoparticles made of cross-linked polymer chains whose pores can be modified to carry and deliver therapeutic drugs and other agents. 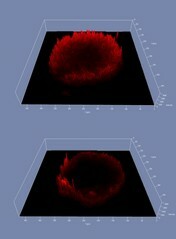 These images show two polymeric nanogels of the same size (about 100 nanometers) but different numbers of crosslinks. When applied to breast tumor “mimics” (spheroids), the nanogel with fewer crosslinks (upper panel, red) was better able to penetrate the spheroids compared to the nanogel with more crosslinks (lower panel, red). Understanding the factors that determine tumor penetration of nanogels will lead to more effective nanomedicines.